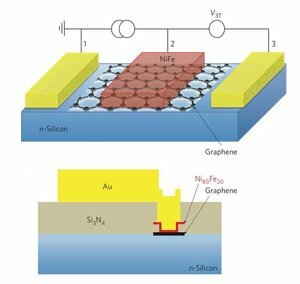 Researchers from the US Naval Research Laboratory (NRL) discovered a way to use graphene as an extremely thin "tunnel barrier" to conduction. This could be very useful for Spintronics devices. The researchers have shown that graphene can serve as an excellent tunnel barrier when current is directed perpendicular to the plane of carbon atoms. The spin polarization of the current is also preserved by the tunnel barrier. The researchers replaced the normally used oxide barriers (which introduce defects into the system and feature too high a resistance) with graphene - which is defect resistant and chemically inert and stable.